Ordering is easy, we help you every step of the way! Show colleagues, get feedback, check sizes. It's the perfect way to find the perfect product. Be certain with FREE samples—just click 'request a free sample' on any product page or give us a call. You've got a job to do, so let our design pros take care of making sure you—and your logo—look great! Whether it's ready to go or a sketch you want to bring to life, send us what you have and we'll do the rest—for FREE. And you’ll always get a FREE 'e-proof' to approve before we proceed with your order! Personal, expert service on every order. Whether you're on the web or over the phone (we’re happy to work either way! ), every order is cared for by people who will make sure every detail is as you wish. This includes an experienced promotional product expert who will work with you personally on your order and our team of professional artists. It’s like having additional members of your own marketing team whenever you need them! We know time is money, so we won't waste yours! We take service seriously, so please give us a call - we’d love to meet you. And, if you wait more than 60 seconds to talk to our team, we’ll give you $25 off your next order! If you're looking for promotional products you've come to the right place. We promise to make ordering quick and easy, and we're sure you'll save money. Plus, as a 4imprint customer, you'll receive our regular Blue Box® mailings. These special boxes come to you filled with FREE samples, offers, information on the very latest products and much more. Watch the video below to see more! "With so many companies out there offering promotional products it's hard to know who to trust. Will the company you choose get your logo right, will they deliver on time for that important event, is the price right, will you get the personal attention you need? Heck it's sometimes hard to tell whether the company is real at all. 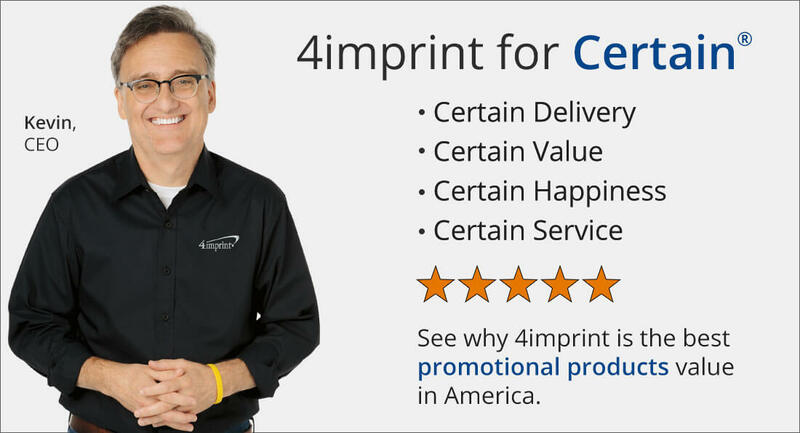 So why should you trust 4imprint? We understand our job is to make you and your organization shine and we've got the people and a guarantee to back it up so you can be certain. Hi, I'm Kevin Lyons-Tarr, CEO of 4imprint, and we would like to take a moment to touch on the reasons why we think we're the right promotional products company for you. We know finding the perfect product is important. The product needs to fit your brand and your promotion whether it's products from the world's most beloved brands or inexpensive giveaways that get attention, we've got what you're looking for, including many brands you won't find anywhere else. Free samples - we'll send those out at no charge. We want that product to physically get in their hands so they can touch it, feel it, and use it so when and they get their order they know exactly what they're going to pay for it so there's no surprises when they go to place their order. Making sure your logo looks perfect regardless of the product or imprinting method is crucial - that's what we on the 4imprint art team take care of. No need to create artwork yourself, just send us what you have. From rough ideas to finished art and we'll take care of the rest. Think of us like your own personal art team. So, join the hundreds of thousands of customers that count on us - you won't be disappointed. We've got a great team here who's ready to help and would be grateful for the chance to help you. We'll make sure you shine. Thanks for watching - have a great day!"